1 A None No Power Seat 1 A is a standard Business Class seat located at a bulkhead. The proximity to the lavatory and galley might be bothersome. There is no floor storage for use during takeoff and landing. 1 C None No Power Seat 1 C is a standard Business Class seat located at a bulkhead. The proximity to the lavatory and galley might be bothersome. There is no floor storage for use during takeoff and landing. 1 D None No Power Seat 1 D is a standard Business Class seat located at a bulkhead. The proximity to the lavatory and galley might be bothersome. There is no floor storage for use during takeoff and landing. 1 G None No Power Seat 1 G is a standard Business Class seat located at a bulkhead. The proximity to the lavatory and galley might be bothersome. There is no floor storage for use during takeoff and landing. 10 A None No Power Seat 10 A is a standard Economy Class seat located at a bulkhead. Floor storage might not be available for use during takeoff and landing. The tray table is in the armrest making the armrest immovable, therefore, slightly reducing seat width. 10 B None No Power Seat 10 B is a standard Economy Class seat located at a bulkhead. Floor storage might not be available for use during takeoff and landing. The tray table is in the armrest making the armrest immovable, therefore, slightly reducing seat width. 10 C None No Power Seat 10 C is a standard Economy Class seat located at a bulkhead. Floor storage might not be available for use during takeoff and landing. The tray table is in the armrest making the armrest immovable, therefore, slightly reducing seat width. 10 D None No Power Seat 10 D is a standard Economy Class seat located at a bulkhead. Floor storage might not be available for use during takeoff and landing. The tray table is in the armrest making the armrest immovable, therefore, slightly reducing seat width. 10 E None No Power Seat 10 E is a standard Economy Class seat located at a bulkhead. Floor storage might not be available for use during takeoff and landing. The tray table is in the armrest making the armrest immovable, therefore, slightly reducing seat width. 10 G None No Power Seat 10 G is a standard Economy Class seat located at a bulkhead. Floor storage might not be available for use during takeoff and landing. The tray table is in the armrest making the armrest immovable, therefore, slightly reducing seat width. 12 A None No Power Seat 12 A is a standard Economy Class seat. Recline might be limited due to the emergency exit directly behind. 12 B None No Power Seat 12 B is a standard Economy Class seat. Recline might be limited due to the emergency exit directly behind. 12 C None No Power Seat 12 C is a standard Economy Class seat. Recline might be limited due to the emergency exit directly behind. 12 D None No Power Seat 12 D is a standard Economy Class seat. Recline might be limited due to the emergency exit directly behind. 12 E None No Power Seat 12 E is a standard Economy Class seat. Recline might be limited due to the emergency exit directly behind. 12 G None No Power Seat 12 G is a standard Economy Class seat. Recline might be limited due to the emergency exit directly behind. 14 A None No Power Seat 14 A is a standard Economy Class seat located at an exit row. This seat features extra legroom, however, the tray table is in the armrest making the armrest immovable, therefore, slightly reducing seat width. There is no floor storage for use during takeoff and landing. 14 B None No Power Seat 14 B is a standard Economy Class seat located at an exit row. This seat features extra legroom, however, the tray table is in the armrest making the armrest immovable, therefore, slightly reducing seat width. There is no floor storage for use during takeoff and landing. 14 C None No Power Seat 14 C is a standard Economy Class seat located at an exit row. This seat features extra legroom, however, the tray table is in the armrest making the armrest immovable, therefore, slightly reducing seat width. There is no floor storage for use during takeoff and landing. 14 E None No Power Seat 14 E is a standard Economy Class seat located at an exit row. This seat features extra legroom, however, the tray table is in the armrest making the armrest immovable, therefore, slightly reducing seat width. There is no floor storage for use during takeoff and landing. 14 G None No Power Seat 14 G is a standard Economy Class seat located at an exit row. This seat features extra legroom, however, the tray table is in the armrest making the armrest immovable, therefore, slightly reducing seat width. There is no floor storage for use during takeoff and landing. 15 D None No Power Seat 15 D is a standard Economy Class seat. This seat has extra legroom due to a crew seat directly ahead. However, the crew seat has a tall seatback. The tray table is in the armrest making the armrest immovable, therefore, slightly reducing seat width. 19 A None No Power Seat 19 A is a standard Economy Class seat with a misaligned window. 19 G None No Power Seat 19 G is a standard Economy Class seat with a misaligned window. 20 A None No Power Seat 20 A is a standard Economy Class seat with a misaligned window. 20 G None No Power Seat 20 G is a standard Economy Class seat with a misaligned window. 26 A None No Power Seat 26 A is a standard Economy Class seat. Recline might be limited due to the emergency exit directly behind. 26 B None No Power Seat 26 B is a standard Economy Class seat. Recline might be limited due to the emergency exit directly behind. 26 C None No Power Seat 26 C is a standard Economy Class seat. Recline might be limited due to the emergency exit directly behind. 26 D None No Power Seat 26 D is a standard Economy Class seat. Recline might be limited due to the emergency exit directly behind. 26 E None No Power Seat 26 E is a standard Economy Class seat. Recline might be limited due to the emergency exit directly behind. 26 G None No Power Seat 26 G is a standard Economy Class seat. Recline might be limited due to the emergency exit directly behind. 27 A None No Power Seat 27 A is a standard Economy Class seat. There is extra legroom due to the location at an emergency exit row, however, there is no window. The tray table is in the armrest making the armrest immovable, therefore, slightly reducing seat width. There is no floor storage for use during takeoff and landing. 27 B None No Power Seat 27 B is a standard Economy Class seat located at an emergency exit row. 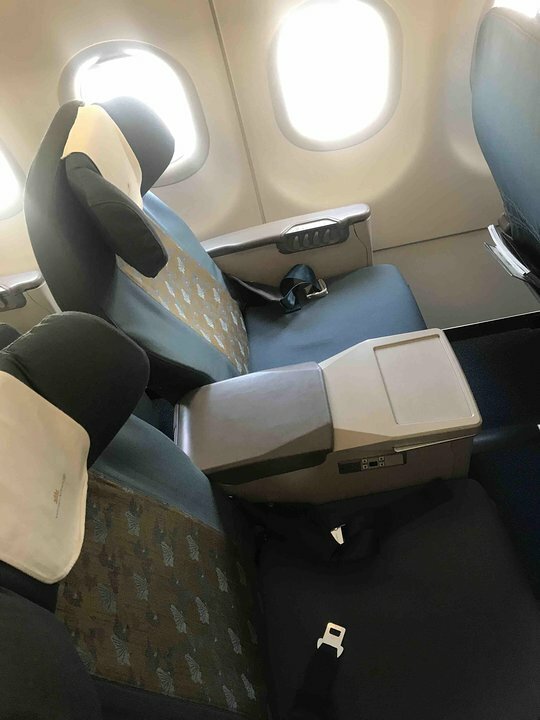 This seat features extra legroom, however, the tray table is in the armrest making the armrest immovable, therefore, slightly reducing seat width. There is no floor storage available for use during takeoff and landing. 27 C None No Power Seat 27 C is a standard Economy Class seat located at an emergency exit row. This seat features extra legroom, however, the tray table is in the armrest making the armrest immovable, therefore, slightly reducing seat width. There is no floor storage available for use during takeoff and landing. 27 E None No Power Seat 27 E is a standard Economy Class seat located at an emergency exit row. This seat features extra legroom, however, the tray table is in the armrest making the armrest immovable, therefore, slightly reducing seat width. There is no floor storage available for use during takeoff and landing. 27 G None No Power Seat 27 G is a standard Economy Class seat. There is extra legroom due to the location at an emergency exit row, however, there is no window. The tray table is in the armrest making the armrest immovable, therefore, slightly reducing seat width. There is no floor storage for use during takeoff and landing. 28 D None No Power Seat 28 D is a standard Economy Class seat. This seat has extra legroom due to a crew seat directly ahead. However, the crew seat has a tall seatback. The tray table is in the armrest making the armrest immovable, therefore, slightly reducing seat width. 37 A None No Power Seat 37 A is a standard Economy Class seat located in the last row of the aircraft. Recline might be limited. The proximity to the lavatories and galley might be bothersome. 37 B None No Power Seat 37 B is a standard Economy Class seat located in the last row of the aircraft. Recline might be limited. The proximity to the lavatories and galley might be bothersome. 37 C None No Power Seat 37 C is a standard Economy Class seat located in the last row of the aircraft. Recline might be limited. The proximity to the lavatories and galley might be bothersome. 37 D None No Power Seat 37 D is a standard Economy Class seat. The proximity to the lavatories and galley might be bothersome. This seat might often be bumped by service carts and passengers passing from the back of the aircraft. 38 E None No Power Seat 38 E is a standard Economy Class seat located in the last row of the aircraft. Recline might be limited. The proximity to the lavatories and galley might be bothersome. 38 G None No Power Seat 38 G is a standard Economy Class seat located in the last row of the aircraft. Recline might be limited. The proximity to the lavatories and galley might be bothersome. Overhead screens are featured in both classes throughout the cabin. On flights over 90 minutes, passengers will be offered a selection of snacks and refreshments. For flights over 2 hours a hot meal will be served. 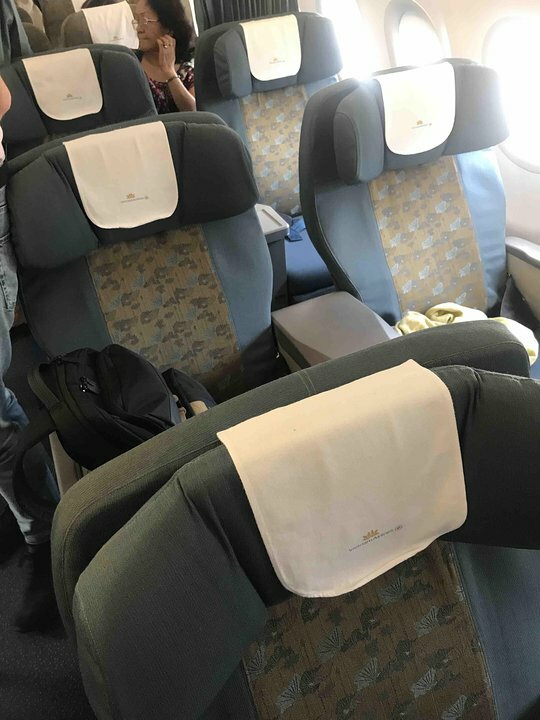 Vietnam Airlines Airbus A321 comfortably carries 178 passengers. They are primarily used on flights within the southeast and northeast Asian region. Business class is the same in all short haul Flights. Seats dated but comfy. Large amount of leg room. Recline backwards quite far. Seats very wide. Seat in the last row, stays in the upper position all the time, no possibility to fold it down. Ive flown this aircraft many times with this airline in Business and it is very good. The food is very nice with a choice of 3 cooked meal options for a 2hr flight, The service is always warm and friendly and crew are good with kids on my 10+ flights with them. Seat is comfortable except the material is a bit scratchy if on bare skin my young daughter kept complaining to me about. Recline is acceptable for that type of aircraft. The planes always seem to be newish and kept in good condition. Vietnam Airlines flies 3 versions of A321-200.